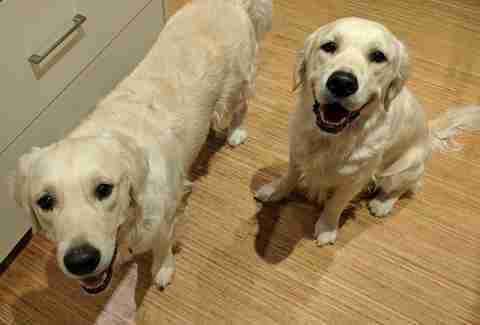 It's fair to say that Bleu and Colby have always had it made — but 15 months ago something happened that made the two lovable golden retrievers' lives even better. They met their new kid sister, Chloe. Bleu and Colby's owners, Chris Cardinal and his wife, didn't know it at the time, but the pups would eventually transform that adorable, innocent baby into their own little partner in crime. "Colby was immediately, 'This is my person,'" Cardinal told The Dodo. "Bleu took some warming up. Then he realized she was capable of giving pets." 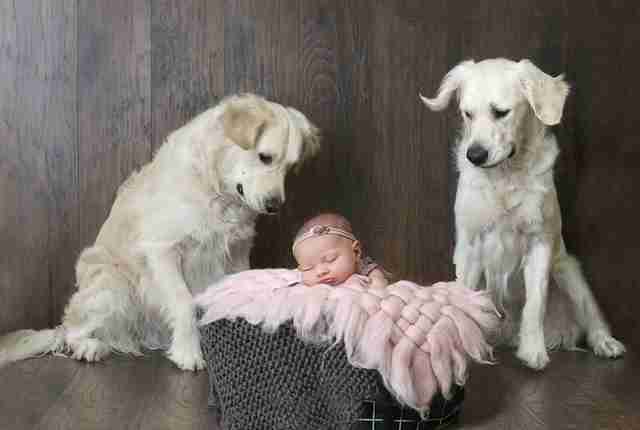 As Chloe reached toddlerhood, however, the dogs discovered she could do more than show them affection. Turns out, this tiny human was far more generous in doling out treats on a whim than her comparatively stingy parents. 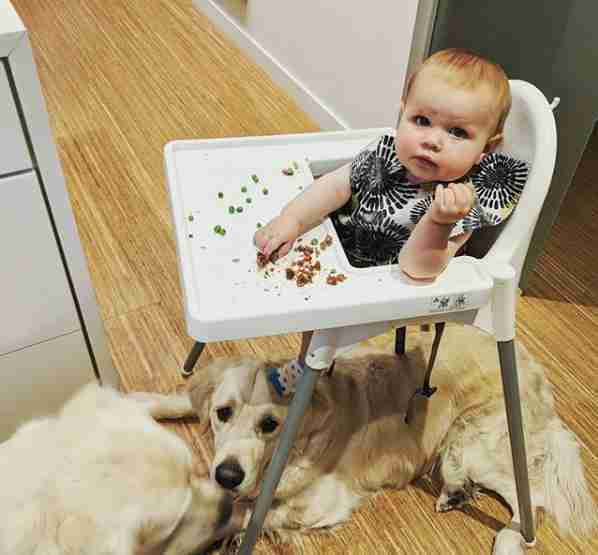 Soon, the floor beneath Chloe's high chair became the place to be. Bleu and Colby were clearly loving all of those illicit, unsanctioned snacks from Chloe, though they recently came to the conclusion that she was probably good for even more, and getting treats randomly wasn't cutting it. So, rather than wait around, they went straight to the source. Chloe's parents only learned about this adorable back-dealing after finding their toddler mysteriously up and about outside her room one morning. The door had been closed during the night, and Chloe isn't tall enough to reach the knob yet. It was only upon reviewing footage from the camera inside Chloe's room that her parents learned the truth: The dogs had helped her escape on the promise of an early breakfast. "They definitely knew what they were doing," Cardinal said. "They start getting real hungry around 6 a.m., and instead of barking outside our room, I think they figured they'd try the baby. They've snuck into her room before overnight once, but not for breakfast. (At the time, she wasn't walking yet.) So this is the first time it effected a prison break." Chloe was apparently more than happy to provide her pals with those subversive snacks. 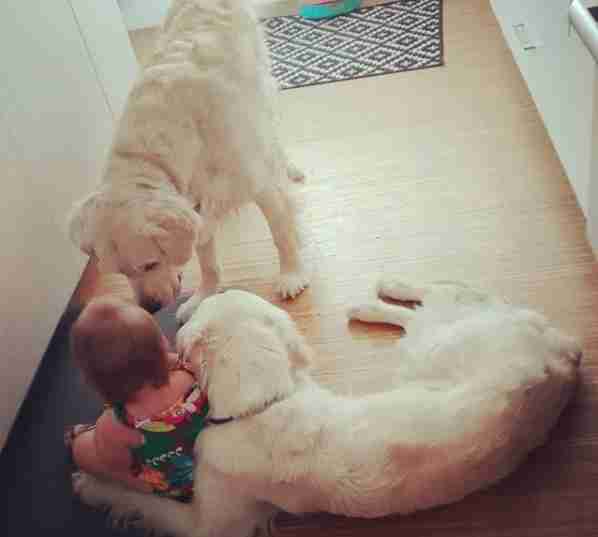 The toddler's parents suspect this early mischief-making between their daughter and dogs is just the tip of the iceberg — though they wouldn't trade the sneaky trio's friendship for anything. "Chloe wakes up every morning and asks to see 'puppeh,'" Cardinal said. "She has to go give them their pets each morning. They teach her how to be gentle with animals, socialization, etc. — and also how to get back up when they knock her over, which happens from time to time." "We're second-guessing having another baby, for sure," Cardinal joked.